Kinetic sculptures by Andrew Jones. Mainly linear elements balanced and articulated to move simply in the wind, light or strong. I work to commission. Guide prices are given below the videos or a price for a limited edition. If you would like to visit me in Ely and see some of my work, please contact me. 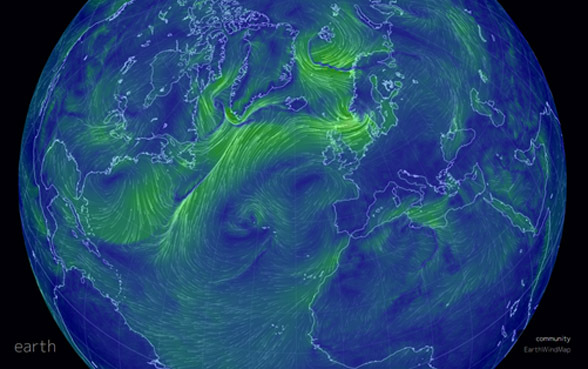 Flow observations of wind and water . A little bit of summer with birds. Listen. Plastic cups at Margate outside the Turner Gallery. It was windy. As I walked past I noticed this little dance of detritus caught and cornered in the eddies. Finally the cups joined a little sand dune blown from the beach. Meniscus. Rain water on slate. A small piece of slate holds a meniscus of water after rain. The reflected roof line of my workshop makes a curved diagonal which is distorted by the wind. This is unprepared and just as I found it. In a shady wood, dappled sunlight casts shadows of leaves under the shallow water, while the autumn sky is reflected on the surface, bright against the backdrop of the leaf shade. And then a silent breath ripples the image. Particles of ash ascending from our open fire grate. The fire is out and the grate is being raked. The particles are caught in a torch beam shone across the fireplace. The video is at half speed. Wait a moment for them to appear. Domestic boiler cloud between house and hedge. Seaweed, North Cornwall April 2014. Debris on concrete on a gusty day. Particles moving in straight lines and curves. The movement is not well defined, but the interest lies in the sudden bursts of movement. The video has not been speeded up. Bare lime tree branches. Crossings. Rock pools. Air on water: ripples. Bubbles.